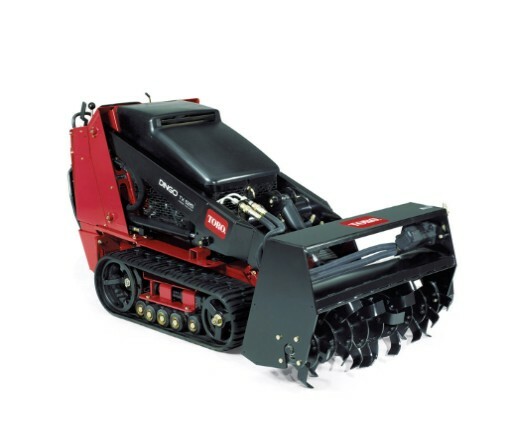 Looking to rent a Tiller Rental attachment for the Toro Dingo in Rochester NY, Ithaca NY and Western New York? The Duke Company proudly carries a comprehensive range of rental attachments for the highly versatile, productive and powerful Toro Dingo. With an A+ reputation for prompt delivery and convenient pick-up, the Duke’s team of rental experts would be glad to assist you with tool rental and heavy equipment rental items from the industry’s leading manufacturers. The Tiller Rental Attachment is a widely respected Tool Rental item. Precision tuned hydraulics can be operated at variable speeds and is reversible.